All day, all ages and FREE? Hello, Make Music Pasadena! 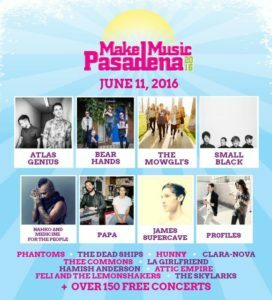 On Saturday June 11th, an eclectic selection of musical programming will be showcased at the 9th Annual Make Music Pasadena festival. From Australia’s Atlas Genius to local favorites the Mowgli’s, the Dead Ships and PAPA to Brooklyn’s Bear Hands, there’s bound to be a little something for anyone and everyone. Covering too many genres to mention, MMP will boast a lineup of over 150 artists featuring a mixture of established, as well as on the rise talent during the festival’s 12-hour run which occupies six main stages and 30+ additional venues utilizing 20 city blocks in downtown Pasadena. See the lineup (with more to be announced) below, plus here’s a Make Music Pasadena Spotify playlist for you. Also, check out a slice of our coverage from last year’s festival HERE.